Nusa Lembongan is an unspoilt tropical paradise, with very little traffic and no pollution. The smiling and friendly locals will welcome you to their idyllic surrounds, to their rich and diverse culture, beaches, quaint villages, and hindu temples. This eight square kilometre island paradise is a world away from the pollution, hassles and hectic pace of Bali. There are no hawkers, no traffic, magnificent scenery and it is the perfect place to put your feet up and relax. Located 12km off the coast of Sanur and just 8 square km in size, Nusa Lembongan offers some of the best diving and snorkelling in Indonesia as well as several popular surf breaks. Fishing, mountain biking, hiking and a variety of water sports are also available. Just 30 minutes by fast boat or 10 minutes via a scenic helicopter ride. Lembongan is in a group of three islands - Nusa Ceningan and Nusa Penida lie to the south - and is the only island of the group with tourist accommodation and facilities. Two towns are located on the island which has a local population of only 5,000. Jungut Batu is the one that first attracted surfers some 20 years ago. This is the main bay where the majority of tourist activity is based and accommodation ranges from basic huts to luxurious resorts. Mushroom Bay, a smaller and very pretty bay, is home to the established Nusa Lembongan Resort. 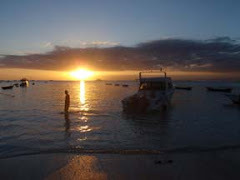 This is a great swimming bay with calm waters and little alfresco cafes along the beach to while away lazy afternoons. Visitors wishing to get away from the busier Jungut Batu and discover the rugged untamed coastline of the west coast will generally arrange to come into Mushroom Bay by boat. The purpose of this blog is to publish just about anything about Nusa Lembongan. It could be news, travel tips, travel guide information, write-ups of experiences from the world class diving and surfing sites on the island.... let's see where it takes us.